"Mom, may we please leave the door open?" Zachary asked. "No, we need to keep the door shut," Mom said. "But I want to let the outside in," Zachary said. "Please, Mom. It's so nice out today." "I guess it will be okay. It is nice to have a cool day for a change." Zachary smiled. He loved having the doors and windows open after the long hot summer in Louisiana. Zachary and his mom were busy fixing peanut butter sandwiches. Going to school made Zachary hungry. The sun shining through the doorway, and the fresh air made Zachary even hungrier. Zachary's mom stood at the kitchen sink peeling an apple when Zachary felt something touch his leg. He looked down. "Mom, there's an Egret in our kitchen." 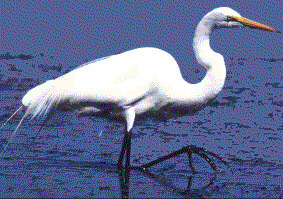 Click on the picture to learn more about Egrets. "Out, out Egret. You cannot have a snack with Zachary." So the egret fluttered out the open door. Zachary sat down at the kitchen table to eat his apple and sandwich. He felt something touch his foot. "That egret must be back." He looked under the tablecloth. "Mom, it's not an egret. It's a rabbit!" "Shoo, shoo, rabbit. You can't come inside," Zachary's mom said. She chased the rabbit around the kitchen and back out into the yard. Zachary finished his snack and took his dishes to the sink. He felt something touch his foot. "Not again. What could it be this time?" Zachary looked down. "Mom, it's not an egret and it's not a rabbit, it's a turtle", said Zachary. "Well, we'll have to find out what he eats. Do you know what kind of turtle he is? Do you know what he likes to eat or where he likes to live?" Mom asked. "No, but I know how to find out. I'll use the computer. Will you help me?" Zachary asked. "That sounds like a good idea, Zachary." "I have another good idea," Zachary said. "Let's close the door before an alligator strolls in." American Alligator. Click To Learn About This Species. Becky Huck Craig is the mother of two teenage sons. She has lived in Illinois, California, Texas, Wyoming, and currently resides in Louisiana with the egrets, crawfish and alligators. She has been writing for about five years and has been published in Turtle and Child Life Magazines. She enjoys writing for children, water skiing, and following her sons bands. She would love to hear from you. Her e-mail address is: brianc@net-connect.net.